Click “import it again” in Cashnotify. “Been loving the @CashNotify app lately. Must have if you're selling stuff online using Stripe. We're Bastien & Julien from Baguette Engineering, a bootstrapped company making apps & SaaS for independent entrepreneurs. 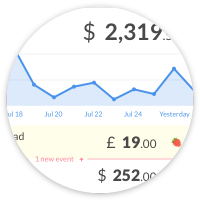 CashNotify is a Windows and Mac menu bar app providing alerts and failed payment notifications for Stripe and PayPal. We're not affiliated with Stripe, Inc. The Stripe name and logos are trademarks or service marks of Stripe, Inc. or its affiliates in the U.S. and other countries. Other names may be trademarks of their respective owners. Emoji logos by EmojiOne and licensed under CC-BY 4.0.